The plenary session at WCLC 2018 in Toronto and parallel NEJM publication bring us the eagerly awaited overall survival results from the PACIFIC trial (NCT02125461). This was a randomised double-blind phase 3 study in good performance status patients with unresectable stage III NSCLC, without disease progression following at least 2 cycles of platinum-based concomitant chemo-radiotherapy (cCRT). The standard of care for these patients has long been platinum-based concomitant chemo-radiotherapy but 5-year outcomes have remained low and unchanged for years. The trial randomised (2:1) 713 patients between May 2014 and April 2016, within 1-42 days following cCRT, to durvalumab 10 mg/kg iv q2w or placebo for 12 months. Progression-free Survival in the Intention-to-Treat Population. Image from NEJM. 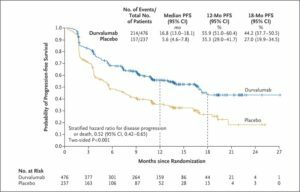 With a median follow-up of 25.2 months, durvalumab significantly improved overall survival compared to placebo (HR 0.68, p=0.00251) with a median survival not reached vs 28.7 months, a 1–year overall survival of 83% vs 75% and a 2-year OS of 66% vs 56% in the durvalumab and placebo arms, respectively. Improvements in progression-free survival and incidence of new lesions with durvalumab vs placebo were maintained, consistent with the prior report in NEJM 2017. However an unplanned sub-group analysis of patients with tumours <1% PD-L1 positive subsequently reported at the ESMO2018 Congress suggests that this patient group may not derive clinical benefit. It is important therefore that tumour PD-L1 testing is now performed in all good PS patients with stage III NSCLC. Overall the treatment was well tolerated and specifically there were low rates of grade 3-5 pneumonitis in both arms (4.7% vs 5.1%, durvalumab vs placebo arms respectively) with no new safety signals identified. The PACIFIC trial is the first study in many years to demonstrate an additional survival advantage for unresectable, stage III NSCLC over and above the outcomes we achieve from cCRT. cCRT is known to both induce tumour antigen release and an adaptive immune response. This immune response is dampened by tumour PD-L1 over-expression. Adding durvalumab reverses this immune suppression and thus enhances the systemic anti-tumour response to cCRT, translating into an overall survival benefit for this important group of patients. Clearly, there is much still to learn about the role of immunotherapy in stage III disease, including optimal selection of patients and scheduling of treatments. However this is a long awaited, practice changing study for the UK lung oncology community that our future patients with stage III NSCLC will benefit from.